David Horsey has been on a trip to Ukraine and speaking to people there about a free press. His first column, published 9/27/2012, dealt with the problems which are beginning to emerge in this new democracy. As in Russia, rich businessmen -- many allied with Yanukovych -- are building monopolies in all sectors of the economy, including the media. As these "oligarchs" gain control of major media outlets, they stifle aggressive, critical reporting and leave little of the advertising market for independent newspapers, magazines and broadcasters. The second column (and the one to which this cartoon is attached) was published 10/1/2012 and points to the increasing power grab by the Ukrainian president. Ukrainian President Viktor Yanukovych is the model of a new kind of power-grabbing authoritarian. Gone is the preening, bullying fascist in a comical military costume, like Hitler or Mussolini. Mao’s jacket and Fidel Castro’s combat fatigues are out of fashion. Today, it is all business. Today, Stalin would be wearing Hugo Boss or Brooks Brothers, his mustache would be shaved off and he, like Yanukovych, would look like any chief executive flying business class. The pogrom and the putsch have given way to PR. Yanukovych has hired lobbyists and public relations teams to help him project a progressive image while he quietly squeezes the press and rejiggers election laws to guarantee his party permanent rule. Horsey's ostensible point in each column is to show how this fledgling democracy is sliding back into a form of dictatorship, one that the US needs to confront diplomatically rather than ignore completely. Yet I can't help but think that what we are seeing in Ukraine is the same set of processes that are being played out in this country. Media ownership in the US has been consolidated and reconsolidated so that the news, both print and electronic, are owned by fewer and fewer entities, all of them corporate in nature. One need only look at local newspapers names: Journal Sentinel, Star Tribune, Journal Constitution. And the same owners usually have a local or national television station. And as to slick image make-overs, our current politicians on both sides of the aisle have availed themselves a-plenty. 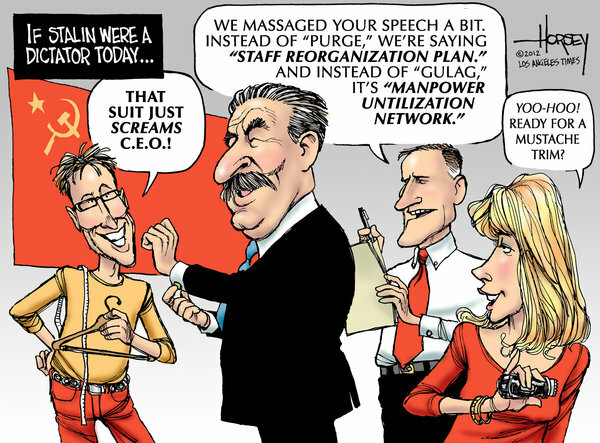 The euphemisms of the cartoon are just as viable in the US as they are in Ukraine. In fact, I suspect Yanukovych hired Podesta for just that reason. The very worst of our system is being emulated by the Ukraine leadership, something which I find appalling. And, sadly, it may very well work.